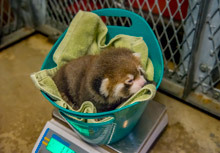 International Red Panda Day, a global commemoration to conserve and celebrate red pandas, is coming up on September 15, so what better time for the Zoo to announce the birth of its first red panda cub? The new female cub, yet unnamed, was born June 6; the same day as her father! The cub was born to first-time parents, mother, Dr. Erin Curry, also known as Dr. E., and, father, Dash. Mother, Dr. E., is 3 years old and is from the Cincinnati Zoo. Father, Dash, is 6 years old and is originally from the Granby Zoo in Quebec, Canada. Because the youngster is still getting acclimated to her new surroundings, animal care staff is allowing her plenty of time to become comfortable before her introduction to visitors. It’s the Zoo’s hope she will make her public debut in the next few weeks. 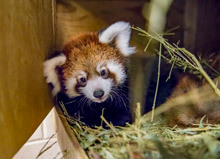 An expected 100,000 visitors at more than 60 AZA (Association of Zoos and Aquariums) accredited institutions worldwide will recognize International Red Panda Day, celebrated annually the third Saturday in September. Red pandas are solitary animals, only interacting during mating season. 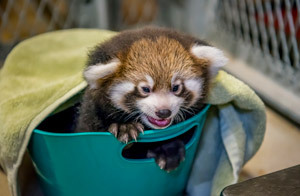 Young red pandas develop at a slow rate, spending the first year or more with mom. Blind for the first 21 to 31 days after birth, mothers keep cubs hidden in nests for the first two to three months. Mothers then teach the cubs how to climb and hunt. Red pandas rely on bamboo for most of their diet, specifically the most tender, young shoots and leaves. But, they are only able to extract one-fourth of the nutrients from the bamboo. So, red pandas spend up to 13 hours a day searching for and eating bamboo. During the summer months, they supplement their diet with fruit and insects. Cubs stop nursing around 13 to 22 weeks old. The new cub started tasting bamboo and biscuits after she was weaned. Adult red pandas weigh up to 14 pounds and are around 2 feet-long, but their tails add extra length of up to 18-inches! This new addition weighed 166 grams at 3 days old and could fit in the palms of her keeper’s hands! She is now about 2,538 grams or 5 pounds and keepers say it takes both hands to pick her up. Red pandas are easily identifiable by their reddish-brown color, white face markings and speckling of black around their ears and legs. They begin to get this adult coloration around 50 days old, which acts as a camouflage. The fur covering their bodies also covers the pads on their feet. This helps red pandas keep the heat in their bodies during the cold winter months. Zookeepers report that the cub is doing very well and first-time mother, Dr. E, is doing a great job raising her first cub. Details of her debut will be coming soon!